Hradec Kralove, Czech Republic. 5th May 2014. One of the things that bike riders never know about in a foreign country is how other road users will treat them. That may sound strange but it’s important to have a feel as to how much trust you can place in the actions of other road users. This isn’t simply about whether or not they obey the road rules, as much as anything else it’s about how bike riders are regarded by the other driver who, to some extent, has the bike rider’s safety in their hands. For instance, in the UK bike riders were clearly regarded as non-persons by many car drivers if the care and attention paid to them was anything to go by. Generally I think that situation has improved in recent years, perhaps due to a change in our image, although two non fault RTA’s in the last two years makes me wonder. 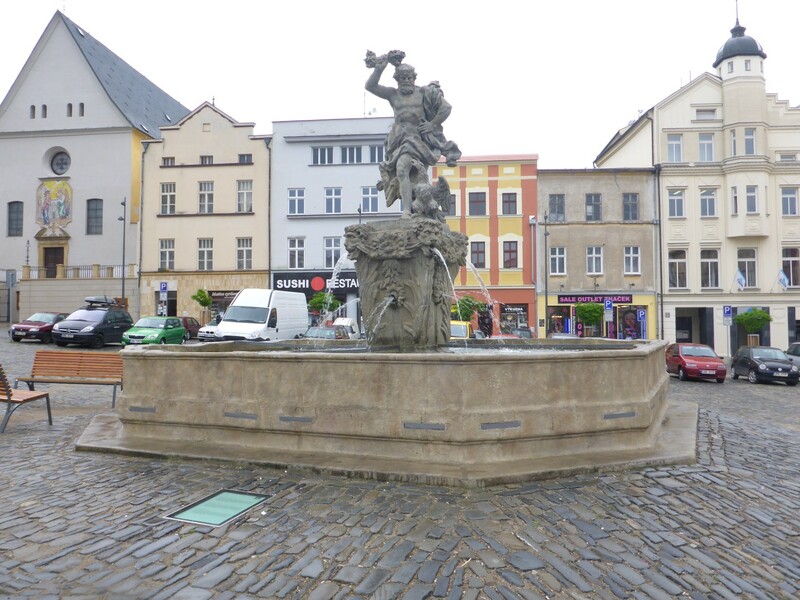 A chilly 120km ride brought me to Hradec Kralove, a town on the confluence of the rivers Elbe and Orlice. I found the tourist information office easily enough and they found me a hotel just down the street. It’s attached to the ice hockey stadium and it was easy to see, by the style of the interior, that it was used for visiting players and student groups. The accommodation was a bit tatty but was OK and I got a twin room with breakfast for Kc650 – just under £20. So I settled in then went for a walk. 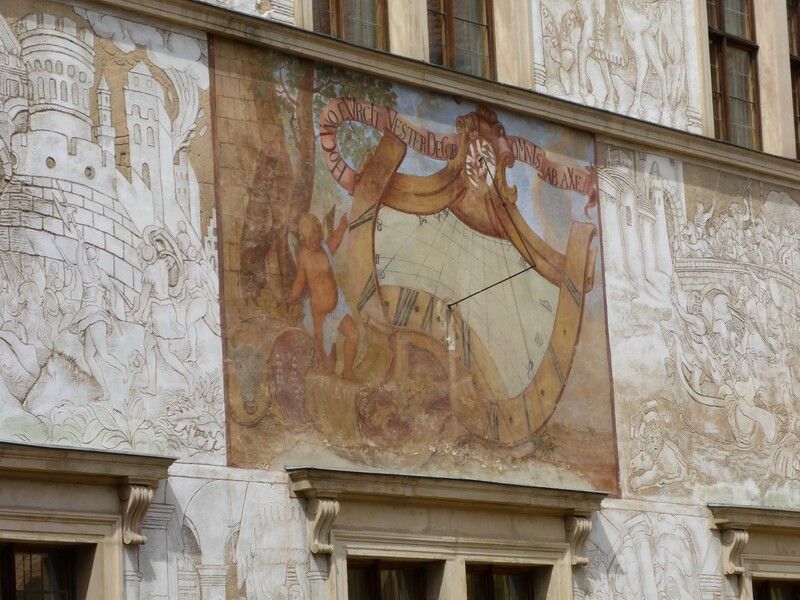 Hradrec Kralove is one of the many former garrison towns in Czechia and one of the attractions for visitors is the Fortress Walk, a stroll around the old town wall and fortifications. Armed with a map, I set off to see what I could see and wasn’t actually all that impressed. I suppose that brick walls and earth banks do have their fans bit I wasn’t one of them that day. So I headed back towards the town centre and just couldn’t raise much enthusiasm for what I saw. But I’d worked up an appetite at least, so I went looking for something to eat. This town wasn’t Prague, where I’d become used to endless cafes, bistros and restaurants all ready to sell you a meal at the drop of a Koruna. Nowhere seemed open for food even though it was late afternoon. Finally I found a Chinese restaurant and managed to get something to my liking. Back at the hotel I caught up on my journal and blog then had an early night. I think, to be fair, I was just tired after three cold nights in a tent and a lot of walking. So I’m sorry Hradec Kralove, maybe next time I’ll be more willing to scratch the surface a bit and find your delights. Up and out on a much warmer day. Destination Olomouc but stopping off at Litomysl en route. Only 150km to cover today so plenty of time to enjoy some culture – if I could find it. 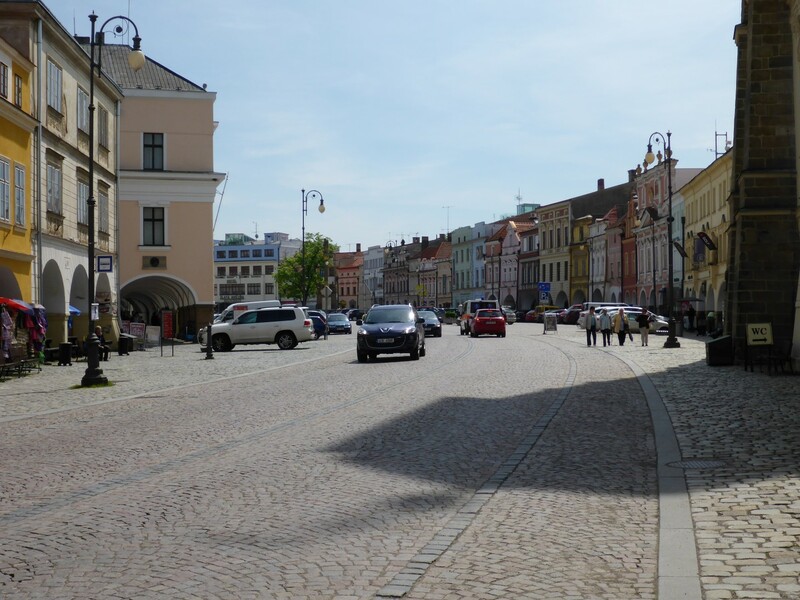 Litomysl is a very nice town, usefully bypassed by the main road so the wide, cobbled main street has plenty of parking and not much traffic. It’s fronted by buildings with an age range from the 15th century through to modern times. Many of them had arcade fronts which housed cafes as well as shops. The shops often had their goods displayed in the arcade and the main street had a relaxed and approachable air to it. I found a cafe to sit and have one of those strong Czech coffees I’ve been getting used to and I enjoyed it so much I had a second. The tourist office supplied me with a brochure showing the town’s delights and, following the map, I rode round to the castle. The wide, quiet main street in Litmosyl. 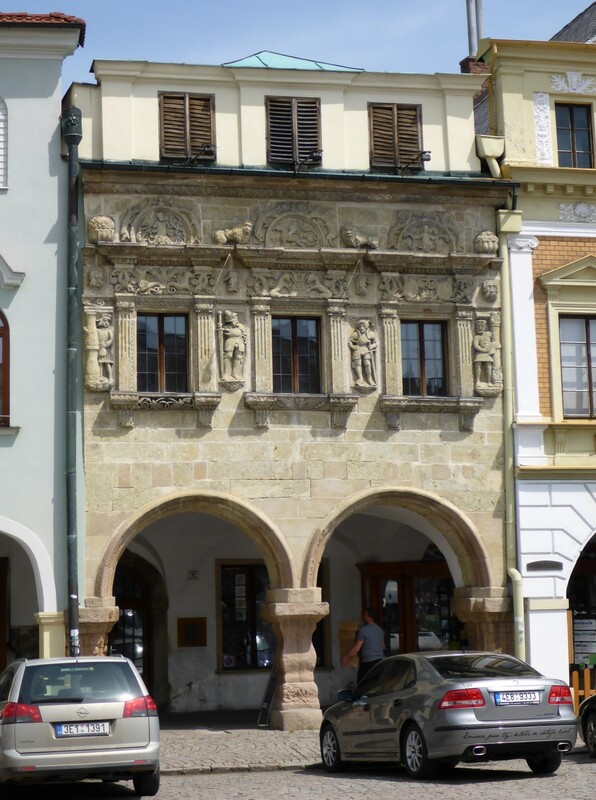 One of the oldest buildings in the main street, a Burgher’s house. 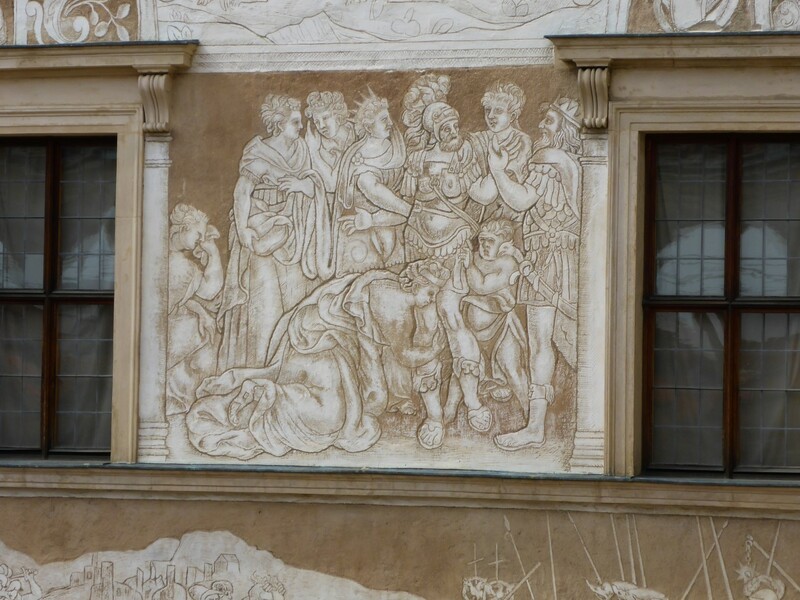 The town of Litomysl began as a hill fort in the 9th century, is on an old trade route between Bohemia and Moravia and a monastery was founded there in the 12th century. Soon after it was granted city status, a Bishopric was established, a castle was built and the town’s growth was assured. In the religious wars of the 14th century the castle and cathedral were burnt down and the town went through various ups and downs. In the late 16th century things were settled enough for a new castle and cathedral to be built on the site of the old ones. I think at this stage it may be wise to give a brief overview of the areas that comprise the current Czech Republic because if you’re going to stick with me on my ride through this lovely country then these names are going to keep cropping up. Czechia is a combination of Bohemia, Moravia and part of Silesia, most of the rest of which now lies in Poland. Since the 9th or 10th century there has been a Duke of Bohemia, later on a king. Bohemia was at first centered around Prague and came under the control of Marovia but as time went by the Duke of Bohemia conquered Moravia and Silesia and the area now known as Czechia came about. It was a very strong and powerful Kingdom in the middle ages but lost much of its power during the religious wars of the 15th century. Over time it became part of the Hapsburg empire. Wars with Prussia led to the loss of most of Silesia and with the collapse of the Holy Roman Empire in 1806 Bohemia was absorbed into the Austrian Empire. There it remained until the end of WW1 when it joined with Slovakia. The rest, I think, you should know! Back up on the hill I took a look inside the cathedral and it was clear that a major refurbishment project was under way. There wasn’t much to see there so I took a walk over to the castle. Built in the popular Renaissance style of chateau, it is set around an inner courtyard which is surrounded by porticoes and sgraffitoed facades. The upper floor has a balcony overlooking the courtyard. Some of the designs of the sgraffiti are based on religious scenes but most of them depict scenes from classic literature. They are stunning to look at and must have been the talk of the region when they were first revealed. The interior of the chateau was refurbished in the 18th century in the Baroque style. This is what Sgraffito is. A base layer of plaster then a second one that’s carved in bas relief. Nice. The only way to see inside the castle was by guided tour and one was due to start not long after I arrived. The only problem was that it would be in Czech, of which I speak not a word, but I was provided with an English translation of the information on each room. So the guide, two elderly women and I wandered around the interior, looking at the various rooms which had all been decorated and furnished in a variety of styles and colours. There was a fair bit of English pottery and furniture in use and it was obvious that the owners had set out to decorate and furnish each room in such a way as to make a statement with it. The first place we went to was the indoor theatre. This could seat 115 people, with the family up on the balcony, their guests below and the servants ranged along the side on benches. Amongst the servants were chimney sweeps whose job it was to extinguish any fires that the theatre lights caused! Although not full sized, the stage was quite deep and it was clear that the productions would have been quite lavish. Having an indoor theatre was quite popular among the nobility at that time and this is one of the few remaining ones. As we moved from room to room I was fascinated by the very large stone or iron stoves which were sited in the corner of most of them. You’d expect to see a door in the front of them but these were very decorative items and their integrity was retained by the simple method of feeding the stove from the back, via a passage behind the room which the servants used. Very ingenious I thought. My favorite room was the Battle Room. 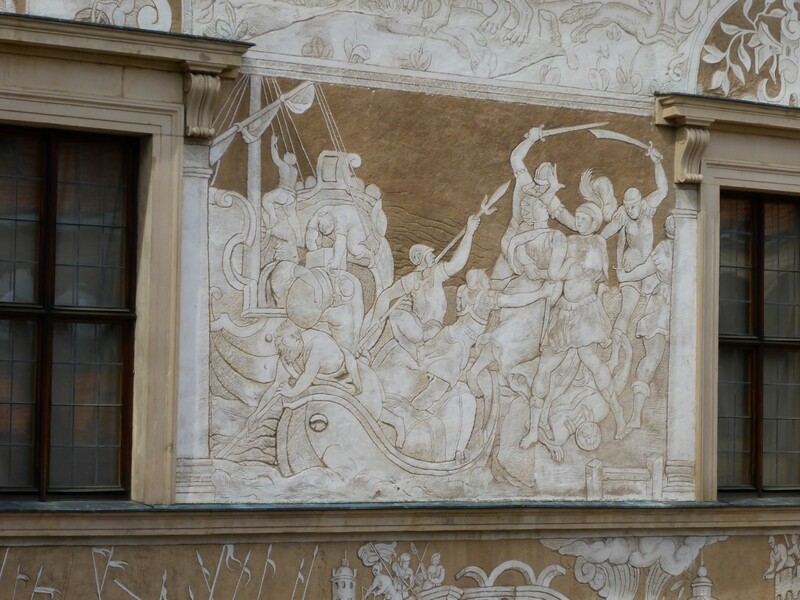 Each wall contained one or two huge paintings of battle scenes which the occupant of the castle, Prince Eugene, had fought in at the beginning of the 18th century. They were very detailed and included battles against the Turks and the French. Needless to say, they were all battles that he had won. Strange, that. The captions above the paintings were written in French so it was the only part of the tour that I could actually understand. Afterwards one of the women approached me and we chatted. She had been a teacher of English and had been in the UK many times. I asked her about the coming together of the Czech and Slovak countries. My assumption had always been that they were forced together by the communists. She told me I was wrong and that they had joined together when the Austro-Hungarian empire collapsed at the end of the first world war. She was also of the opinion that they shouldn’t have separated after the velvet revolution because they are so small, ten million people in Czechia and only five in Slovakia. The separation was inevitable, she said, and very friendly but not a good idea in her opinion. 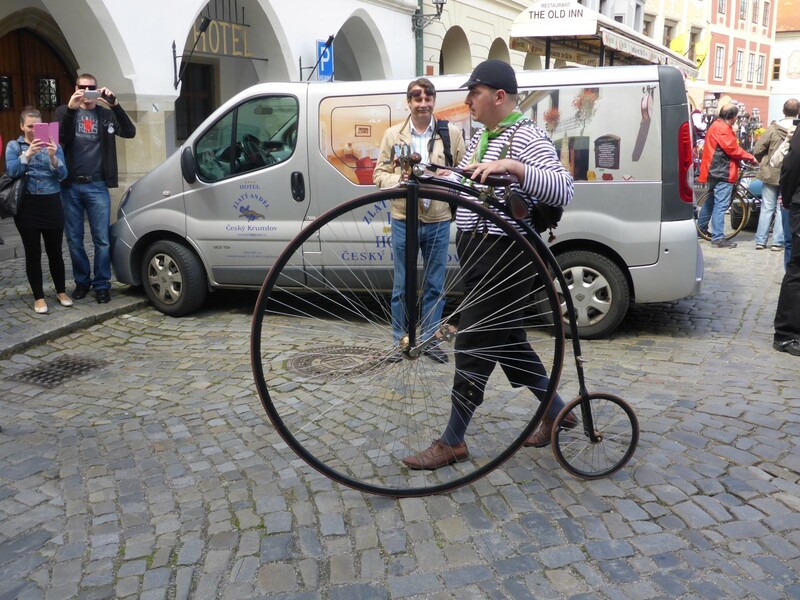 History lesson over, I wandered back down to the bike and set off for Olomouc. Arriving in Olomouc I headed for Centrum but needed the assistance of the assistant in a chemists to point me towards the tourist info office. So good of her to live up to her title! Tourist info got me the last bed in a hostel just down the road called Poets Corner. This would be my first hostel since Munich and, in keeping with the generally lower prices in Czechia it was only Kc300 per night – less than a tenner. No breakfast included but that didn’t worry me. Ludska was expecting me when I arrived and asked me if I wanted to park my bike out the back. ‘Yes please.’was my natural reply especially as the tram lines passed within about 30cm of the kerb, so no parking on the road. I was expecting her to direct me to a gate but she said to ride my bike through the lobby into the enclosed back yard. I managed to squeeze the bike through the front door, then the middle door and finally the back door to leave it in a nice safe place. I was very pleased with this because when I’ve read other travellers’ stories they usually only get to do this in third world countries and here was I still in the EU and ticking one of those little boxes that made me feel like I’d joined the club. The hostel was part of an apartment block and they had two of them. The problem was that my room was on the fourth floor, ninety four steps and no lift. Ludska took my smaller bag, which helped, but it was still a long way up. I can honestly say that I needed the cup of tea she made me by then. Ludska is Czech and her partner Ian is Australian. They met out there. Ian is a keen cyclist and became used to using hostels when he was touring round, especially in New Zealand. That’s what gave them the idea of setting one up in Czechia. The name came from a nearby junction where several streets named after poets all came together. Very poetic. The hostel is nice and homely, with a very comfortable common room and, thankfully, wi-fi. Ludska gave me a leaflet which had a town plan on it where she had identified good places to eat and drink, including some micro breweries and some tea houses. She also pointed out a good cafe which specialised in breakfasts. The leaflet also had some Czech phrases on the back to help visitors with trying out the language. A very good idea, I thought. All settled in, I headed out for a walk round and to find something to eat. Next morning I went out to find Cafe St Angelo, the one recommended for breakfast. I don’t normally bore you with my meal details but the food in this cafe was really good. Porridge came with nuts and fruit in it and the Full English, their piece de resistance, was great although ‘sausage’ is really ‘frankfurter’. The history of this city reflects that of many others in the region. The area was settled by Slavic tribes in the 6th century. Later a monastery was built, followed by a castle. It became a Bishopric and growth continued. 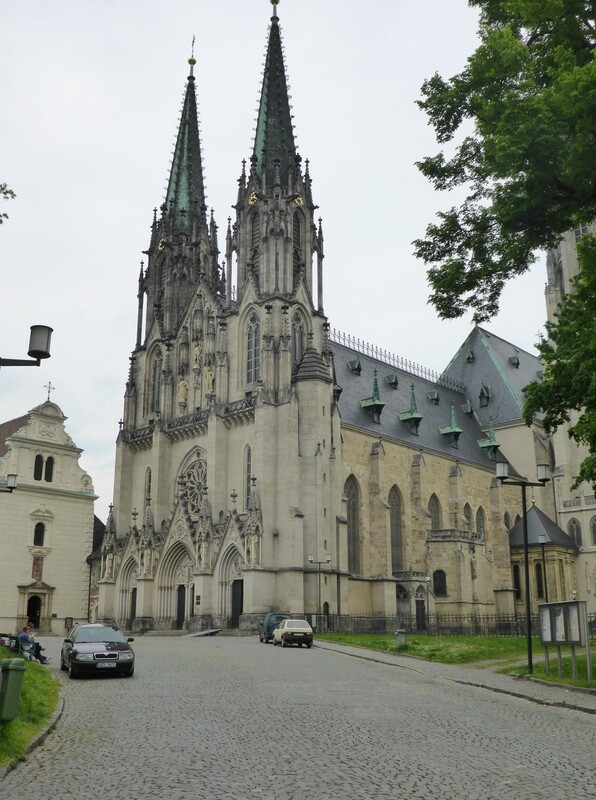 The City was the capital of Moravia until Bohemia absorbed that state but it continued to have an important role over the centuries as a fortified town. The fortifications where very strong but were a mixed blessing. Emperor Franz Joseph II chose the town as a haven when Vienna was threatened in the Austro-Hungarian wars but afterwards they physically restricted the development of the town during a period when many others were setting up industries. The mayor that was elected soon after Franz-Joseph left spent most of his 25 years in office trying to persuade the regional authorities to allow removal of the fortifications. Eventually he won through and the city was able to expand and received a major boost when it became a link on the on the Prague to Vienna train route. In terms of historic buildings there is Wencelas Cathedral, the Old Town Hall, several other churches and some older town buildings. The cathedral was originally built in the 13th century but seems to have suffered he same fate as many others in that it was burnt down and rebuilt a number of times. The present building dates from the 18th/19th century. 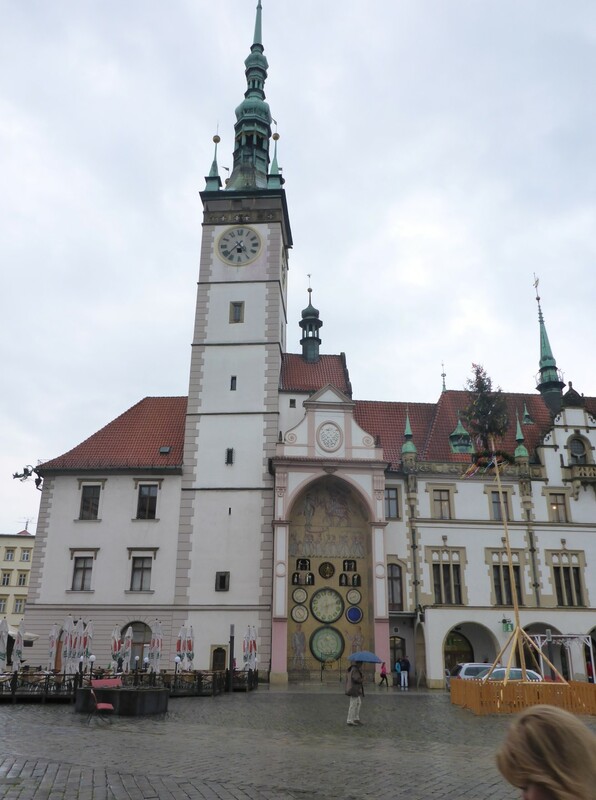 The town hall originated in the 15th century and has an astronomical clock on the front of it. Like the others, this has been renovated many times and the facade around it is from the 1950’s, representing the socialist ideal of the working classes. St Moritz church has a round tower which is freely accessible from the street. Because it is quite narrow it has a rare double spiral staircase, one going up and one down. You all know how I feel about a spiral staircase but two in one tower? I went up, of course, to get a nice view over the wet town. 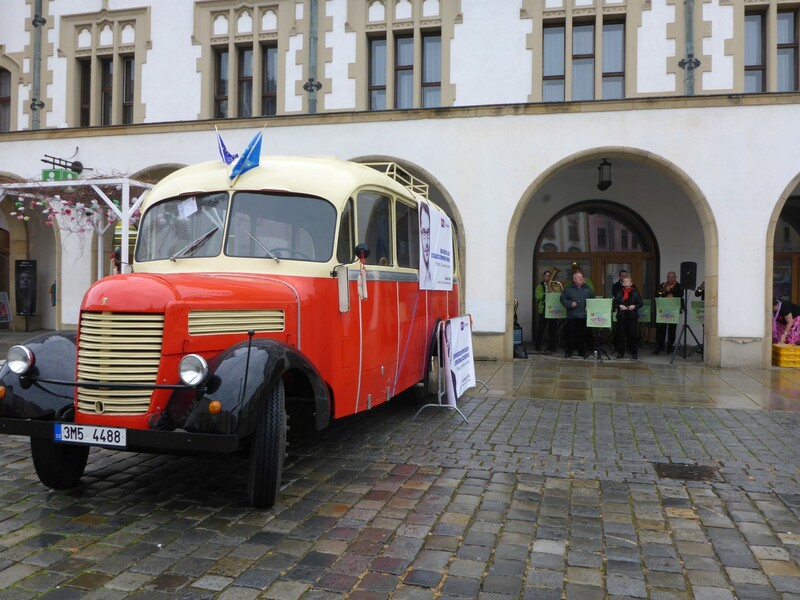 While I was in the town square an old charabanc pulled up and a brass band got out. Placing themselves under the arcades they started to play and sing some tunes which, it soon became clear, were part of an election rally on behalf of one of the EU election candidates. It was raining by now and there were more campaigners than there were electors but they soldiered on gamely. I videoed some of it and was bemused to have first sausage, then cake offered to me along with their campaign leaflets. I was brought up to be polite so I gratefully accepted what I was offered. The sausage was nice, the cake was delicious and the leaflets went in the bin once I was out of sight. 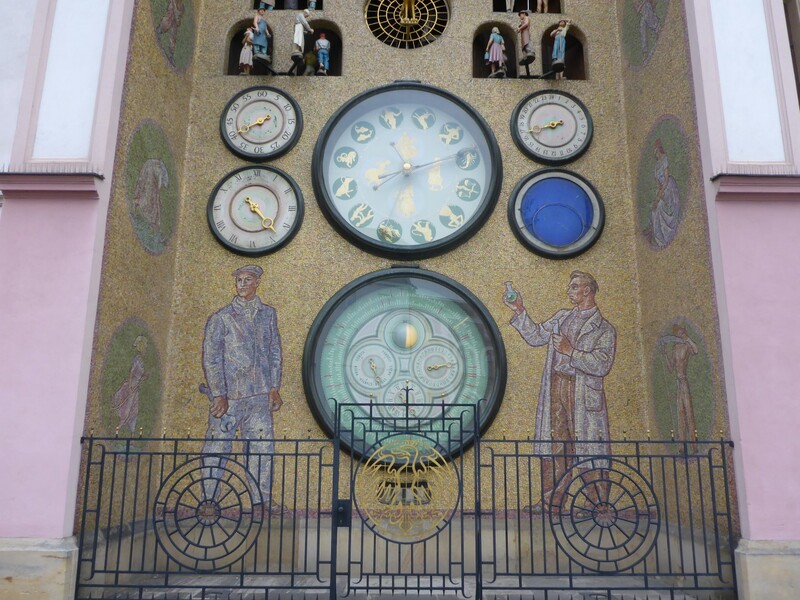 The Socialist Workers take care of this astronomical clock. Earlier I had visited one of the museums in the city and saw the ‘Fifteen Centuries of a City’ exhibition. I always find such displays interesting as it’s a great way to get a flavour of not only the city but also of the region. There was also a ‘Nature of the Olomouc Region’ exhibition, detailing the natural history of the area. The other museums related to modern art and they didn’t really appeal to me. I also tried one of the recommended Tea Houses. Set up in a distinctly eastern style, Cajovna Sofia has low seating and tables with decorated coverings draped across the walls. When I went in I spent a pleasant few minutes discussing what tea to have and settled on some spiced Assam. It was made in the form of Chai, that is, it was brewed with the milk in it. It tasted very nice, if a little too sweet for my taste. I’m surprised there aren’t such places in Britain as I’m sure they’d be popular. It was a new and enjoyable experience for me. When I got back to the hostel three Swedish guys had arrived. There was also a French woman there, all in the same dorm as me. They all spoke very good English and it was nice to be able to sit around and swap experiences with Ian, the owner, that evening. This pair of Morality Drawings were targets for archery practice. One of the fountains the town seems to like so much. Next day was to be history of a different kind. I had learned of an aircraft museum just outside town and a tram ride to the terminus, and a short walk, brought me to what looked like a dilapidated factory unit on a dilapidated industrial estate. 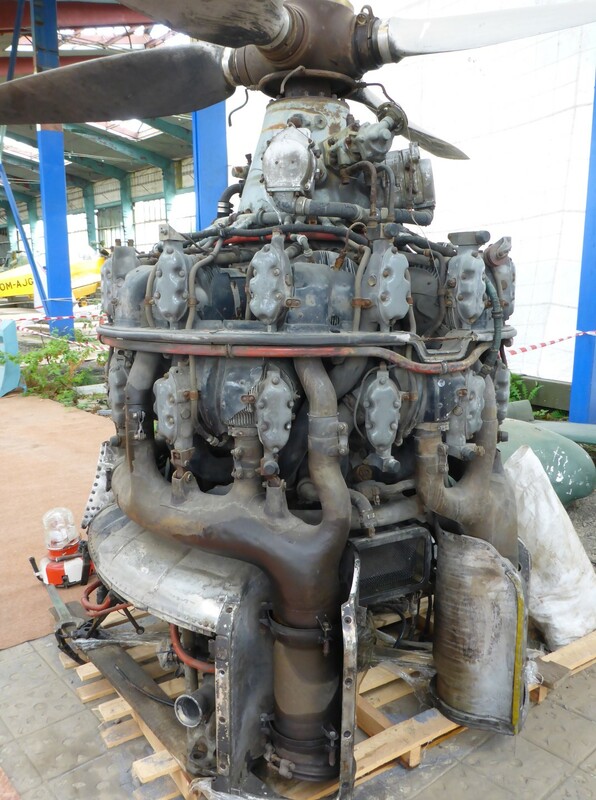 After paying the small entrance fee of Kc50 I was entranced by the rather dilapidated display of old aircraft, missiles, engines and military vehicles before me. 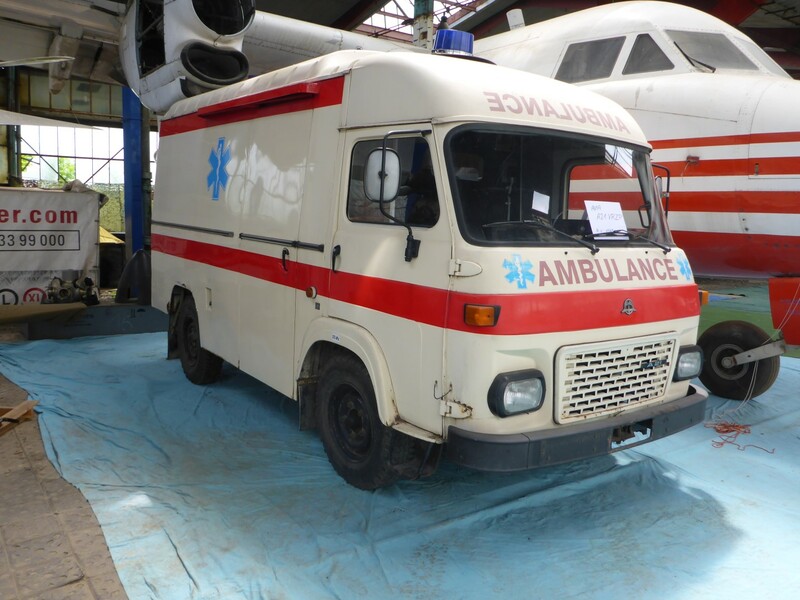 While dilapidation seemed to be a theme, the exhibits were being restored and looked after with some care. There was a guy busy working on one of the planes and some of the vehicles had been restored to a very high standard. It seemed as if the collection had been acquired from military surplus sales after the communist era. 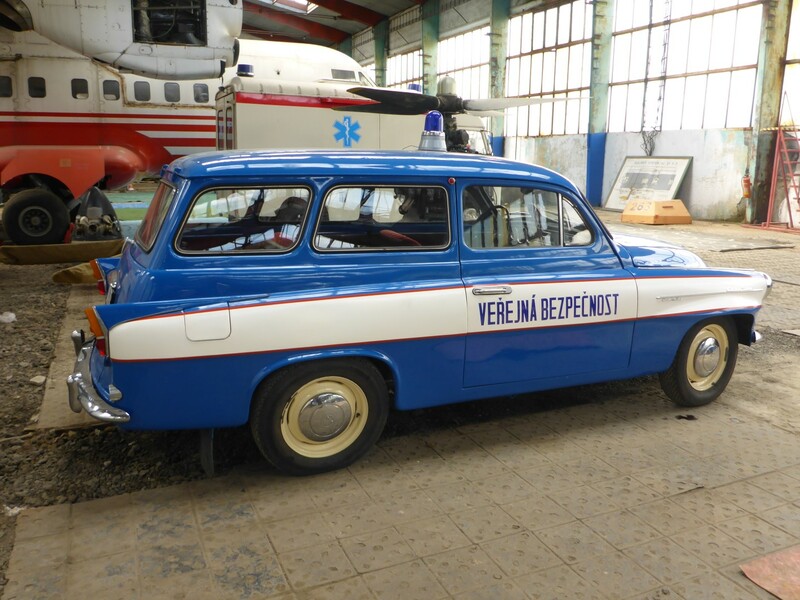 All the aircraft were Russian built with Czech military markings except the police car and ambulance which were of Czech origin. 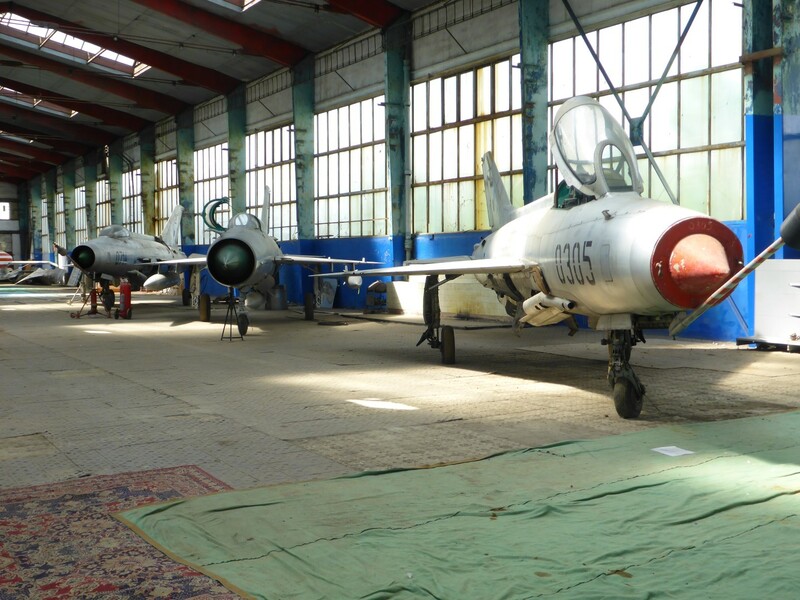 The most interesting items were the three MiG 21 fighters and it was slightly spooky to be close up to the former ‘enemy’ planes. They were given plenty of respect by British and American forces at the time and they looked sleek and powerful even in their current downbeat setting. Three sleek MiG21’s, pride of the Soviet air force. Feel like tuning this little baby up? Thought not. A Skoda Octavia, pre VW takeover..
That evening I went out for a meal with the three Swedish guys, Henrik, Johan and Daniel. It was nice to hear their stories. They’re on holiday from work, enjoying the sights of Europe. Johan had suffered a broken arm in a fall. The first time he’s ever broken a bone, he said. I could tell him a thing or two about that! We went to a bar afterwards and joined several of the other people from the hostel for a pleasant evening chatting. There were several nationalities there – English,Swedish, German, French, Brazilian, Australian and Irish. One of the nice things about hostel life. Everyone spoke excellent English showing how international communications now favour the English speaker, luckily for me. Poets Corner had been a comfortable and easy place to stay but I was worried about getting too comfortable there and needed to move on. 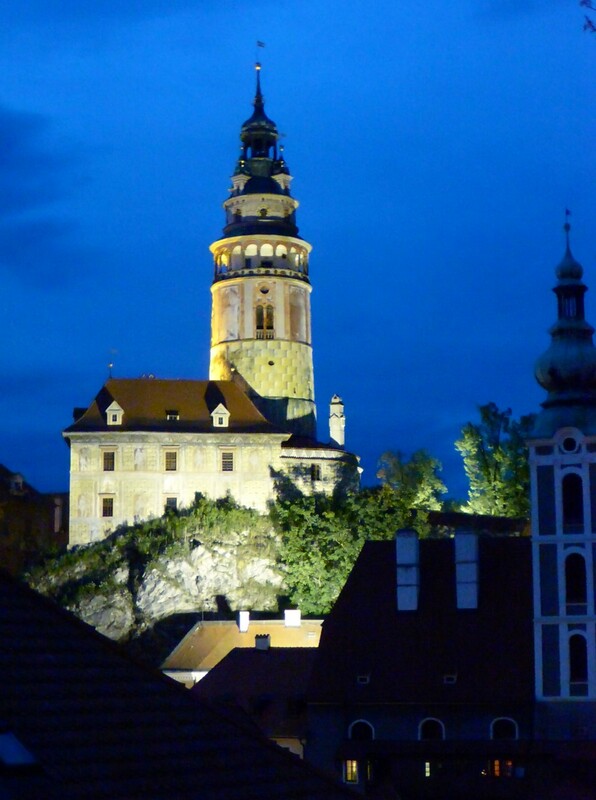 Next destination, Cesky Krumlov. The 300km journey there was enjoyable, across very pleasant countryside, and I had a bike rider’s success and also a disappointment. The success was when I came across resurfacing works a couple of times but could see that no-one was working on them. There were ‘No Through Road’ signs in place but I just kept going and got through easily. Some rough road to traverse but I’m on an off road bike so no problem. The disappointment was when i stopped for a coffee at a roadside stall. There were three other bike riders there but although I said ‘Hello’ I didn’t get any response. So much for the ‘brotherhood of riders’ I thought. Miserable gits! Cesky Krumlov sits on the Vlatava River, the same river as Prague. At this point the river takes a series of huge bends and the town is almost surrounded by water. There are a number of pretty bridges across it. The main feature of the town is the fairytale castle which sits on the hill overlooking it but the town itself betrays its medieval roots with its narrow, twisting streets, alleyways diving this way and that and gutters that run down the centre of the steep streets. It is a really pretty town, with plenty of restaurants and cafes and a nice central square. 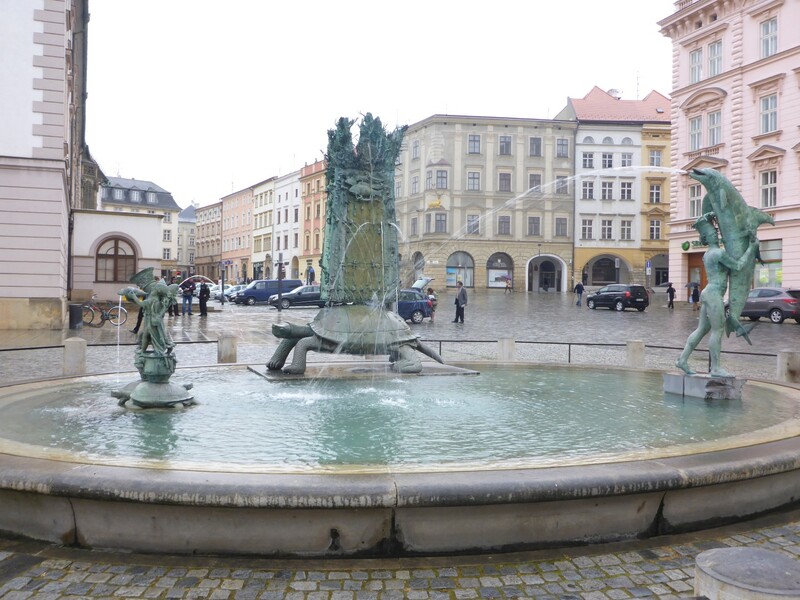 Cobblestones abound of course, but that’s pretty much par for the course in most Czech towns. Beautifully lit to enhance the ‘Fairytale’ atmosphere of the town. I breakfasted at a rather quaint cafe which had a variety of furniture; tables that used to be sewing machine trestles, chairs, benches – nothing matched anything else which was its charm. There were some nice paintings on the wall too giving it a relaxed an comfortable feel. It seemed to typify the rest of the town. Good food too. I walked around the town calling in at the main church, the town museum and the castle. The church is generally quite plain but has the very decorative altar backdrop that has become a common theme in Czechia and also a series of paintings depicting the crucifixion event. They were large, colourful and very lifelike. The museum told the story of the town but concentrated on the 19th century in particular. There was a huge focus on photography here (sorry! ), with several people being involved in the development (sorry again!) of colour photography and new colour printing techniques. The rather sad story surrounding WWII was covered in some depth too. This region had a large German speaking population with much of the town’s cultural activity being German based. In fact the German population helped to educate and improve the lot of the Czech population around the turn of the 19th/20th centuries. Which made the events of WWII all the more upsetting in all their tragedy. Some of the German population welcomed the invasion of Czechia by Hitler and supported the Nazi cause. When the war ended virtually all people of German origin were forced to leave Czechia regardless of whether they’d supported Hitler or not – most hadn’t. Many of them had roots going back many generations. Regardless, they were transported out of the country after the war. 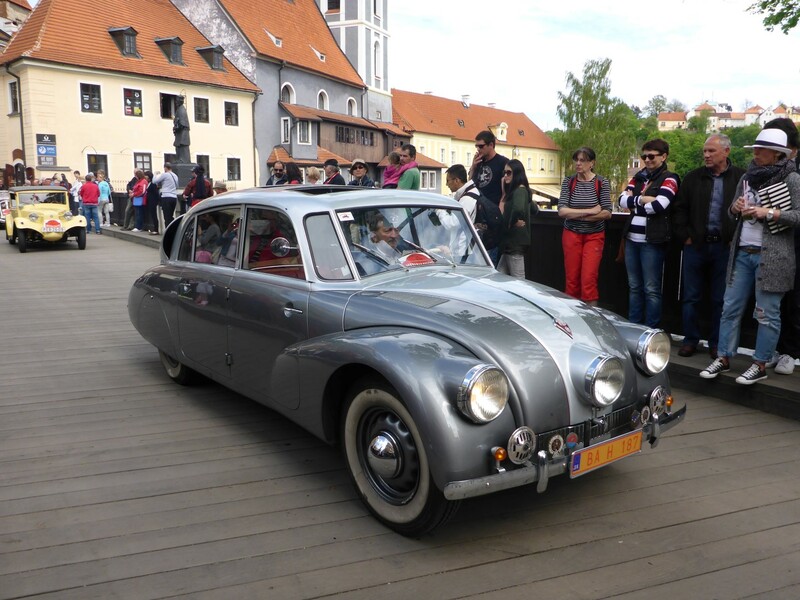 When I got back to the town square I found that a historic vehicle rally was passing through. There was a huge variety of bicycles, motorbikes and cars all rattling over the cobbles, all different ages from the 1900’s up to the 1960’s. Great to watch them bouncing past, very colourful and beautifully restored. 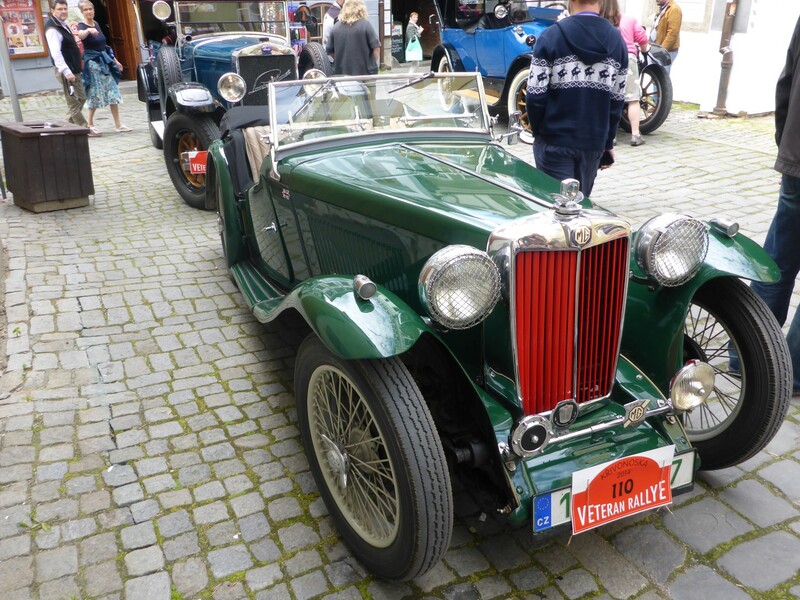 Czech, British, French and American cars and motorbikes of all types and sizes. A great display. Next was the walk up the hill to the castle. The laws of Czech renewal applied here too, with a castle/chateau that had been built in Medieval times and then rebuilt and added to in the renaissance period before being refurbished in the baroque style. It’s the second most important in Czechia, after the one in Prague. 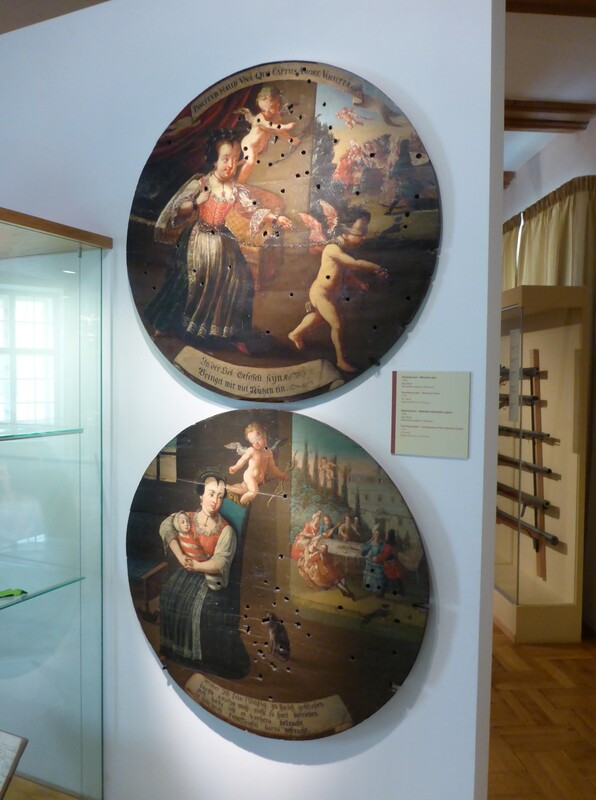 I took the guided tour and saw displays that were similar to the castle in Litomysl but with one very good addition. 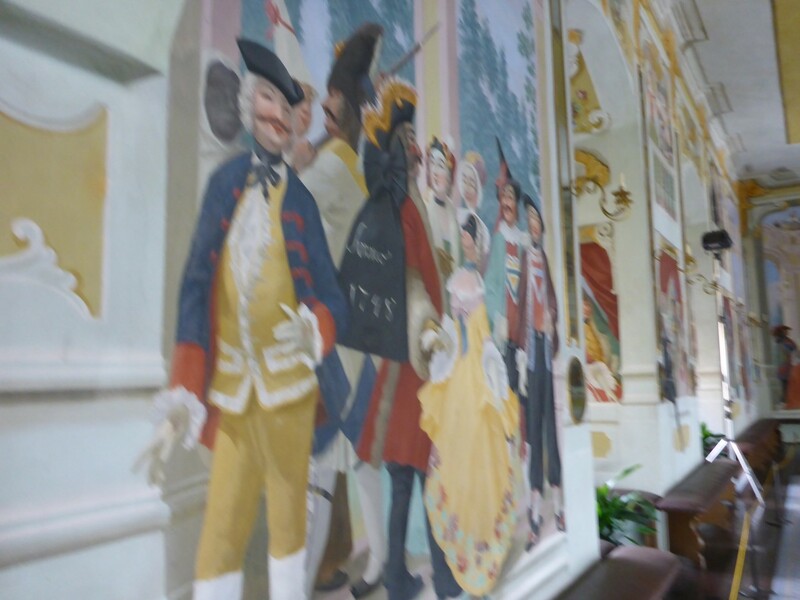 This was a huge ballroom in which the walls had been painted to depict scenes of a typical masked ball from the 18th century. They showed the participants in their various costumes, the musicians up on the gallery and the entertainers and jesters that would have been there too. The colours were very vivid still. Unfortunately no photography was allowed so no pictures to show you. I had to sneak this picture of the ballroom decorations, hence the poor quality. That evening I was determined to have a typical Czech meal and managed to find a restaurant where I could get potato soup and goulash. You wouldn’t think potato soup could be made to be interesting, but it was. Very nice and very cheap too. More Czech adventures to follow. I haven’t quite ‘Czeched out’ yet but I think we all need a rest for the moment. More to come soon, especially for the lovers of bikes among you. Meanwhile, here’s some old vehicles to go with the old town. ‘Cobbles’ he said, or something like that. A very rare beast, in the UK at least. Another great piece of writing. Keep up the good work. Hi Geoff. Nice to meet you so to speak. I was introduced to your blog by a mutual friend since I live in Australia and she told me you hope to eventually head this way. So, I started to read it and love it. Very well written, informative and very comprehensive in a tourist’s version kind of way to which we can readily relate. And, as a bonus for me, you have the same likes it seems as I do; motorbikes first and foremost, travelling, history, photography (judging by a couple of your comments and the quality of your images displayed here) and I guess, technology. So, thanks for doing this for the rest of us who are not able, or willing probably, to do what you are doing, and helping us to make the journey with you. I am very much looking forward to reading your posts, particularly as you travel further and further away from the ‘European’ way of life and exit your comfort zone as it were, haha. Meantime, stay safe and upright as they say, enjoy the journey (which is what it’s all about after all) and know that others are enjoying it too! Hi Phil, nice to ‘meet’ you too. Thanks very much for your kind comments. I’d be interested to know who the mutual friend is, out of interest. I’m definitely heading away from my comfort zone as I should be in Russia in a few weeks. Then I’ll really be feeling adventurous. It’s always nice to know that others are on the journey with me so please do keep in touch. Maybe we can meet when I get down under. Thanks Tim, you’re very kind and I’m glad you enjoyed it. Did you sign up for the email alerts?